The holidays are the perfect time to welcome friends and family into your home. 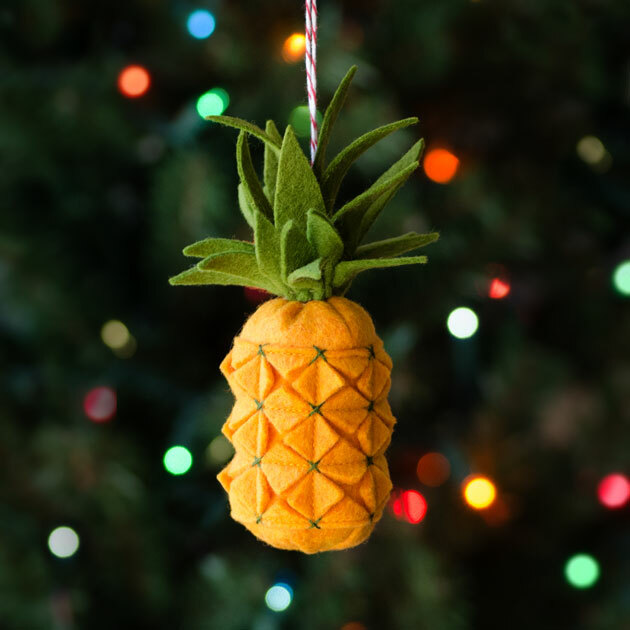 And since a pineapple is known to be a symbol of hospitality, I thought it would make a great ornament. The texture of the pineapple is created by stitching and cutting the felt, then accenting it with a little embroidery. All you need is your sewing machine, gold and green felt, thread, glue, and a little floss and fiberfil. If you’re not a member of the Holiday Stitch-along Ornament Club yet, you can still join! Regular membership starts today, October 16th. The cost is $20 for all 4 ornament patterns that will be released over the coming weeks. If you’d like to simply buy this pattern individually without joining the club, it will be available in my Etsy shop next Monday October 23rd. Keep in mind the cost savings you get with the club ($5 each vs $6 each!) as well as enjoying the surprise and crafting along with other club members.